AT around 4pm today Sunday 24 October, the former St John’s residential home in Downpatrick was destroyed in an arson attack. St John’s House in Downpatrick has been destroyed in a arson attack. The fire grew out of control and before long was a raging inferno with a huge pillar of smoke that could be seen for miles around the town. Six fire tenders from Downpatrick, Ballynahinch and Belfast including a command wagon were at the blaze. The fire fighters encountered difficulties with water supply in finding enough hydrants with an adequate pressure to fight the fire which raged through the building. Fire damage had already been caused to the Pound Lane Clinic opposite over the past year on a couple of occasions, and local residents said to Down News that it was no surrprise that this major fire has happened. Politicians and community leaders have already condemned these arson attacks. 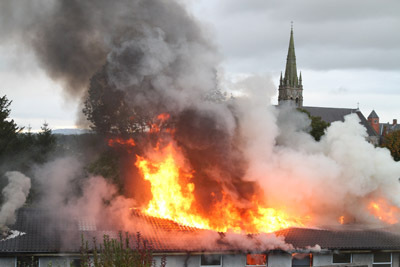 The fire rages in St John’s residential home in Downpatrick after an arson attack. Since the Downe Hospital was also closed around three years ago, which is located next to the St John’s building, there have been numerous reports of vandals stripping the building for copper wire and other valuable items. An adjacent hospital building has had a large section of its roof stripped of tiles while are understood to be worth £3 each when sold on. Police eventyually cordoned off the scene when it transpired there could have been a risk of explosion from empty gas containers. 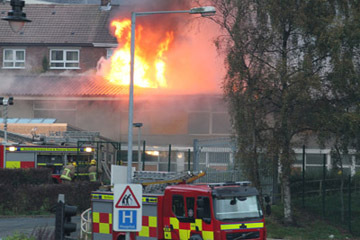 There was concern too when police asked all those watching the fire to move back for fear of asbestos contamination. A tender has been out by the South Eastern HSC Trust for he demolition of the St John’s home building and Down News understands is closes tomorrow. The building, what is left of it, will now need to be completely demolished for public safety reasons. The fire is still burning into the evening. 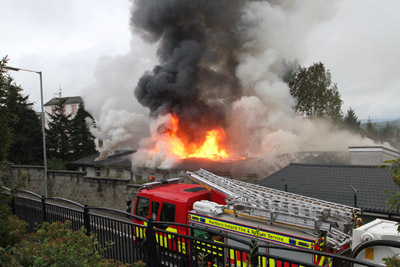 The old St John’s residential home in Downpatrick was destoyed in a blaze.